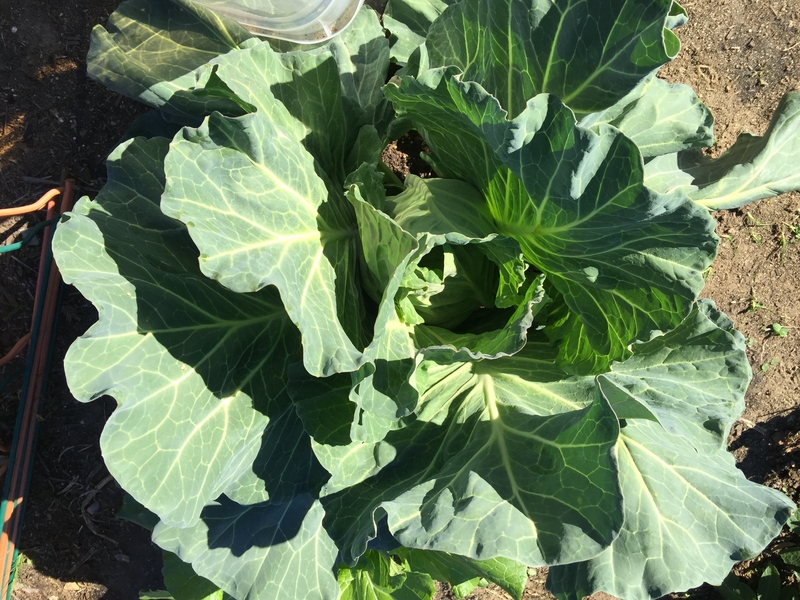 We planted some cute little miniature heads of cabbage November 1st, 2015 near Los Angeles in southern California. We purchased the transplants locally and we wished we had taken a photo of them. 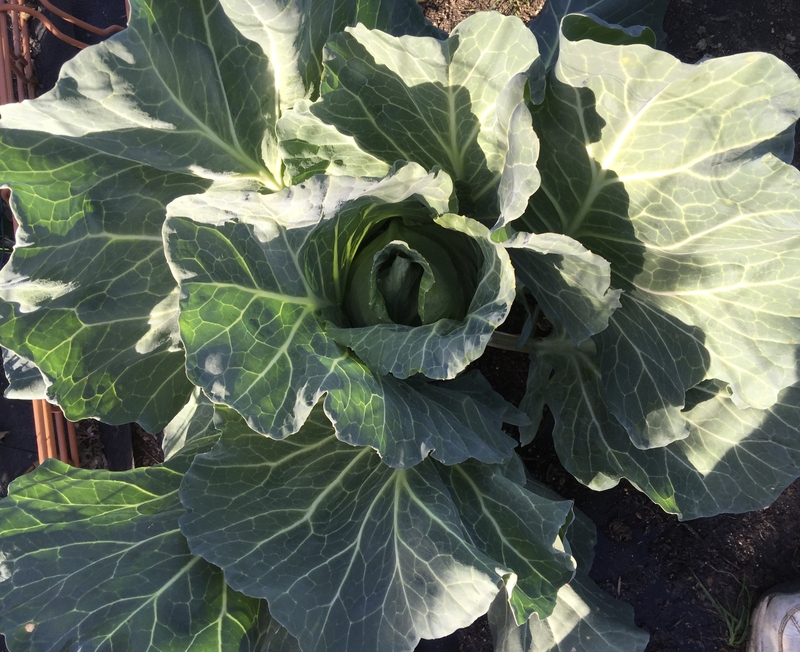 It frosts occasionally where the garden is located so we planted the cabbage along with some broccoli, cauliflower, brussel sprouts, romain lettuce and swiss chard transplants. These plants will tolerate temperatures above 25 degrees pretty well. We had not planted cabbage in a garden in many years and forgot what fun it is to watch. The plant seems to grow so slowly and gradually gets bigger and then seems to explode over the last few weeks before it is ready to cut the head. Broccoli, Cabbage and Cauliflower grow well together and require about the same care. 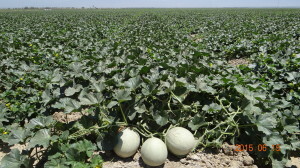 These plants respond well to three heavy applications of nitrogen fertilizer; once just after planting after they have recovered from transplant shock; a second time about a month after planting when they have developed a significant amount of foliage; and a third application just as the heads are starting to form. 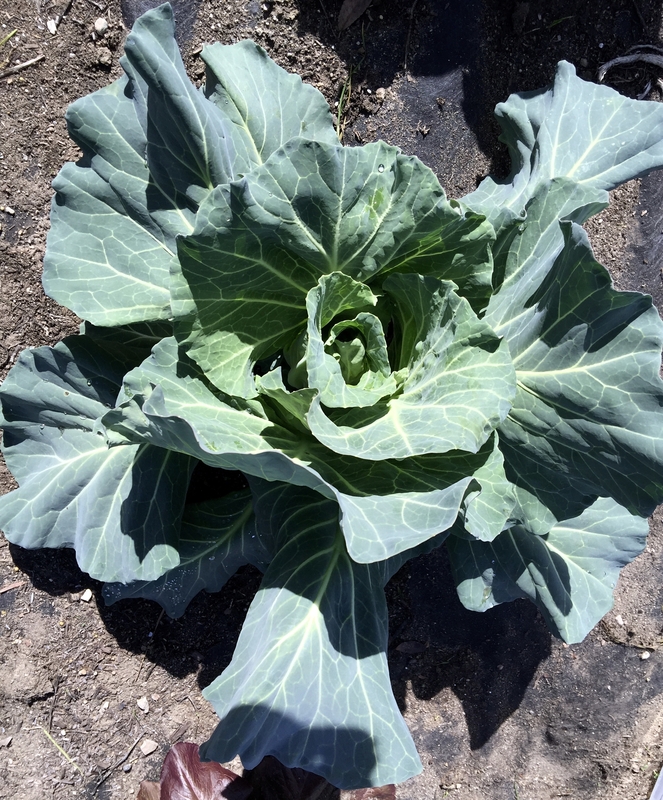 We also use osmocote at planting which in cool weather is a 90 day slow release fertilizer containing Nitrogen (N), Phosphorous(P), and Potassium (K). We grew several acres of pick-your-own broccoli, cabbage, and cauliflower for two years back in the 1980s. We had great success doing this. In our growing situation we built a “bunny fence” around the perimeter of the garden to keep out the rabbits. We also have squirrel and gophers. The squirrels don’t seem to be interested in the cole crops and the gophers seem to be under control at the moment. We also make an effort to control the cabbage looper worms. 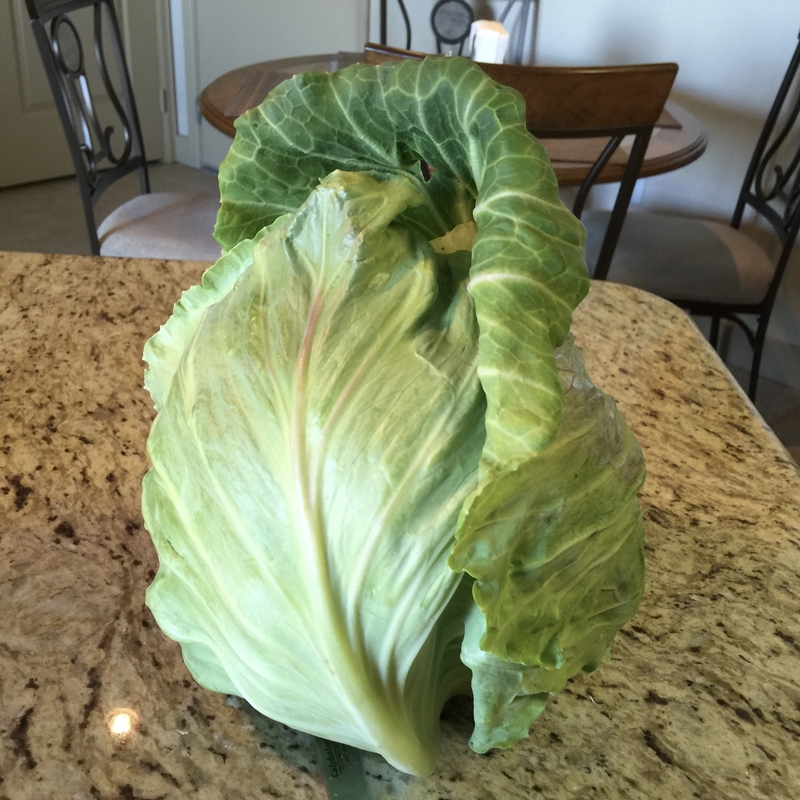 We look forward to making fresh cole slaw, boiled cabbage, and cabbage rolls!! California produces 100% of the almonds in the United States of America and 75% of the almonds in the world. Spanish Franciscan Padres introduced almond trees into what would become California, in the mid 1700s. 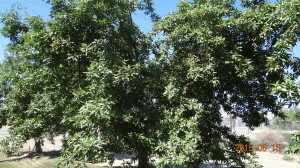 The almonds are grown in the Central Valley in California. Almond trees start to bloom as the weather gets warmer in January and February. 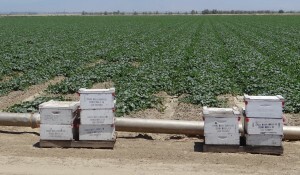 Almonds are not self pollinating and require at least two different varieties to successfully produce fruit. 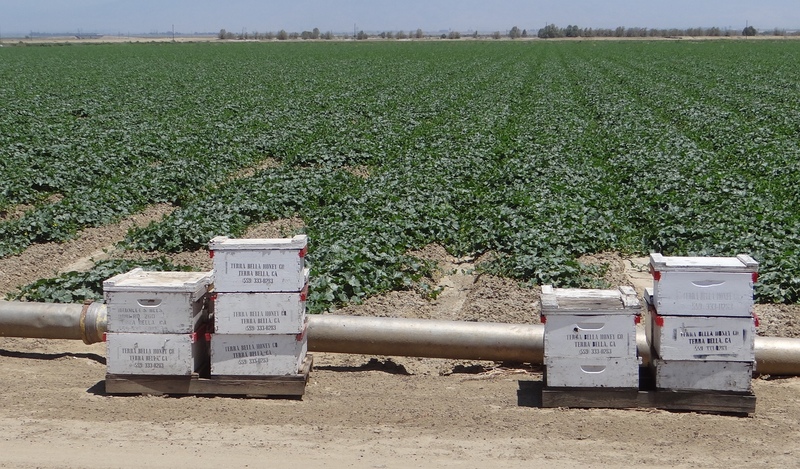 Honeybees are required for maximum pollination. After pollination a fuzzy gray/green hull begins to grow which will contain the almond kernel. The hull continues to grow, harden and mature until July. Next the hull will begin to split and open. From mid August until late October the split will open exposing the almond shell and causing it to dry, as well as the kernel inside the shell. To harvest, the trees are shaken with a mechanical “tree shaker”. The nuts are allowed to dry further on the orchard floor and then swept into rows where they are picked up mechanically. During hulling the shells are separated from the kernels. After harvest, in November and December, the almond tree begins to start the whole process over again by developing new flower buds for next years crop. 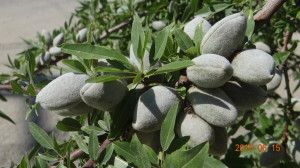 Right now the biggest challenge to growing almonds is the extended drought in California which has already had a limiting impact on almond production.